Come See The Hague through Expat Eyes! 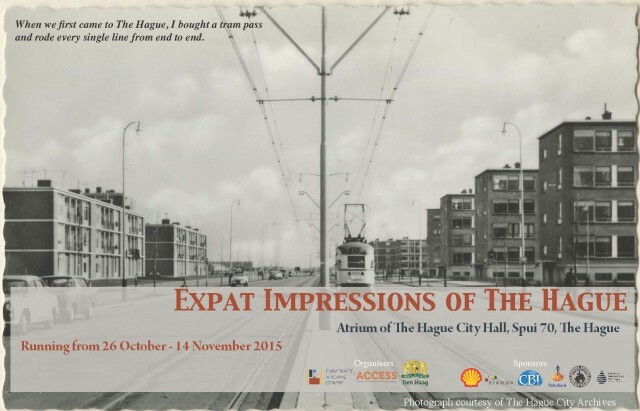 A new exhibition in The Hague City Hall entitled ‘Expat Impressions of The Hague’ will reveal the history of The Hague as seen through expatriate eyes. From the 1950s through the present, the exhibition will showcase visual content as well as stories, letters, articles, and journals written by expatriates, providing a rich picture of what it has been like to live in The Hague as an expatriate during the past several decades. Three organisations have partnered to create the exhibition: The Expatriate Archive Centre, The Hague Municipal Archive, and ACCESS. Sponsors include Shell, The Hague Bridge, CB&I, Rabobank, the American Women’s Club of The Hague, and Petroleum Women’s Club The Hague. The exhibition is free of charge, and will run from 26 October to 14 November 2015 in the Atrium of the City Hall in The Hague. Hours are Monday, Tuesday, Wednesday and Friday from 7:00 to 19:00, Thursday from 7:00 to 21:30, and Saturday from 9:30 to 17:00. The mayor will officially inaugurate the exhibition at an invitation-only reception to be held on 4 November. For more information, contact The Expatriate Archive Centre at (0)70 427 2014 or pr@xpatarchive.com.